This walkthrough is intended as a Kodi home theater setup guide. provide you with a good idea of what kind of awesome gadgets you can use to enhance your Kodi movie-watching experiences on a budget. The concepts in this guide have all been tested by myself and they all have great results: enhanced enjoyment when it comes down to movie-time. It doesn’t take thousands of dollars to have an awesome Kodi home theater! The most notable gadget in this guide is the mini projector: a powerhouse packed into a tiny little box. If you take one thing away from this guide, it’s the ease-of-use and value we can get from a $70 mini projector on which we can play our Kodi movies! 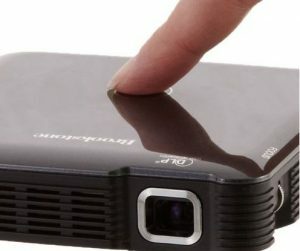 Mini Projectors can output HD movies (the cheaper ones limited to around 720P – nicer ones can do actual 1080P) and they work very well with Kodi. Any device that can run Kodi and output a video signal via HDMI can be used in conjunction with a Mini Projector, since pretty much all Mini Projectors have HDMI ports. About 3 years ago I bought a [easyazon_link identifier=”B00MR24X1G” locale=”US” tag=”arizonacaorg-20″]Brookstone Mini Projector[/easyazon_link] for $250 refurbushed. The little bugger is still running strong! It’s a great mini projector, so you if you can find one like it and use it to play Kodi movies, I highly recommend it. You can buy an inexpensive new [easyazon_link identifier=”B016XR7WA4″ locale=”US” tag=”arizonacaorg-20″]Mini Projector[/easyazon_link] for around $70 on Amazon. Use an [easyazon_link identifier=”B00BEWF4R2″ locale=”US” tag=”arizonacaorg-20″]HDMI cable[/easyazon_link] to connect the HDMI port of a Kodi-enabled device to the HDMI port of the mini projector. Launch Kodi on your device and play something! Congrats, you’re done. Keep in mind the cheaper mini projectors have a low number of Lumens for light output, so daytime viewing is limited to dark rooms. You can get [easyazon_link identifier=”B00R1V33M8″ locale=”US” tag=”arizonacaorg-20″]black-out curtains[/easyazon_link] from Amazon for around $20 each. Or you can buy a full-size projector that puts out 2000 Lumens or more, instead of the 100 Lumens or so you would get from a mini projector. Audio enjoyability is highly underrated by many movie lovers! Don’t let the sound get you down. 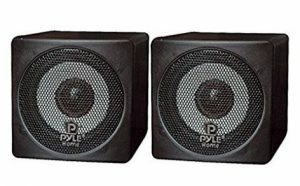 You can get some really decent little speakers and a simple (yet powerful) little amplifier. Each can be had for around $20. So splurge and get a $30 set of [easyazon_link identifier=”B000MCGF1O” locale=”US” tag=”arizonacaorg-20″]speakers[/easyazon_link] (or more if you have the cash – by all means, but the purpose of this guide is value and affordability), as well as a $20 [easyazon_link identifier=”B019MBUX40″ locale=”US” tag=”arizonacaorg-20″]amplifier[/easyazon_link]to push sound to the speakers. Then you simply.. Play a movie / TV show and BOOM – instant “cinema-like” sound for all the movies you stream with Kodi / XBMC. [easyazon_link identifier=”B01EO5QPN2″ locale=”US” tag=”arizonacaorg-20″]Bluetooth gamepads[/easyazon_link] are a particularly awesome combo of blast-from-the-past gaming with new Bluetooth connectivity. This means that we can use some kind of device (FireTV / Fire Stick, Android phone, [easyazon_link identifier=”B011B9E928″ locale=”US” tag=”arizonacaorg-20″]PC[/easyazon_link], laptop) to easily run a game emulator, then we use the Bluetooth Gamepad to play the classic games and still have that controller-in-hand feel! I’ve personally tested this on the [easyazon_link identifier=”B00GDQ0RMG” locale=”US” tag=”arizonacaorg-20″]Firestick[/easyazon_link]and it works flawlessly for SNES games (Super MarioKart, woo!). N64 games are a bit out of the Firestick’s performance capabilities, but many PCs are able to emulate N64 games particularly well. You can also use a Bluetooth gamepad as a “remote” to control Kodi. 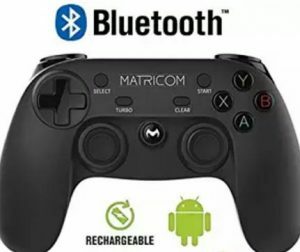 Connecting a Bluetooth gamepad to your device is just like pairing any Bluetooth devices together: press the button on the controller to start Pairing, and then tell your Bluetooth-enabled Kodi device to start listening for Bluetooth. Some emulators (such as SNES9x) work better than others as far as having correct default controller layout. For, the emulators that don’t have correct default button-mappings, you’ll just have to go into the Settings area of the emulator you’re using and map each of the gamepad’s buttons manually. Since most devices these days are capable of running apps that require (or are much better with) keyboard / mouse input, it’s extremely useful to have a Bluetooth keyboard & mouse connected wirelessly to your Kodi device. This makes searching for movies and browsing on your device much easier. Get an inexpensive [easyazon_link identifier=”B01B1PZ4HG” locale=”US” tag=”arizonacaorg-20″]Bluetooth mouse[/easyazon_link] & [easyazon_link identifier=”B005ONMDYE” locale=”US” tag=”arizonacaorg-20″]keyboard[/easyazon_link]for around $30. Pair it with your Kodi device as you would pair any Bluetooth devices together. Keep in mind you can use a Bluetooth keyboard on just about any device that has Bluetooth – such as your phone! Tip for Writers & College Students: So you could actually write a college-level paper on your phone with a “normal” full keyboard layout from a normal (Bluetooth) keyboard. These “magic” color-changing [easyazon_link identifier=”B00SIDVZSW” locale=”US” tag=”arizonacaorg-20″]WiFi LED bulbs[/easyazon_link] are the shnizzle. The future is here: it’s an LED light bulb that changes to whatever color(s) you want it to using your phone to control it. Watching a Cheech & Chong movie? Use the magic LED bulb to turn the room an emerald green. Horror movie? Try a shade of deep red to emulate a “bloody horror scene” feel. Adult time? Try a brilliant red to enhance the mood. Pro Tip: These WiFI LED bulbs can be controlled by voice if you hook it up wirelessly to an [easyazon_link identifier=”B01DFKC2SO” locale=”US” tag=”arizonacaorg-20″]Amazon Echo[/easyazon_link] unit (which has Alexa – Amazon’s voice control system). VPNs (Virtual Private Network) are the hottest new thing in personal Internet security. With the onslaught of “government-snooping” the U.S. and U.K. have seen recently, people feel they need a bit more security, privacy, and anonymity these days. Set up a VPN quickly and easily with our VPN setup guide. To protect the streaming data you send & receive with Kodi, use a VPN to completely hide it all from Snoopy McSnoopersons. Many people have fast Internet connections but their downloads are still really slow. This is usually because routers overheat extremely easily, as well as modems. Whatever network equipment you have – unless if you’ve already dealt with this issue – is most likely overheating as we speak. Don’t believe me? Go touch the [easyazon_link identifier=”B0111MRLES” locale=”US” tag=”arizonacaorg-20″]modem[/easyazon_link]- if it feels warm, it should be cooler. When [easyazon_link identifier=”B000BTL0OA” locale=”US” tag=”arizonacaorg-20″]routers[/easyazon_link]& modems get hot, they drop connections and die out slowly or quickly. Most routers and modems require external fans propped up next to them to get the cooling they need. Due to the sheer physics of transferring gigabytes or terabytes of data, the device is going to create lots of heat – so much heat that it requires active external cooling. Fortunately we can solve this problem with a $10 or $20 [easyazon_link identifier=”B001R1RXUG” locale=”US” tag=”arizonacaorg-20″]fan[/easyazon_link]and point that sucker straight at your modem / router and/or have it circulate all the air in the room. No Stagnant Stevens here! Surge protectors are simple, but often overlooked. We’re not your mother. We’re not going to lecture you on power-safety. But we do recommend that you get a [easyazon_link identifier=”B000JE9LD4″ locale=”US” tag=”arizonacaorg-20″]nice surge protector[/easyazon_link] so your devices don’t get fried in the next hurricane. And that’s the last you’ll hear of it from us. Pro Tip: In addition to protecting your devices from power surges, surge protectors will regulate and often condition the power that’s sent to your devices, making them run smoother and last longer. This one may seem silly, but people usually underestimate the airflow necessary to cool down their devices. We very strongly recommend that you place a [easyazon_link identifier=”B00FXOFM56″ locale=”US” tag=”arizonacaorg-20″]fan[/easyazon_link]in the same room as your audio & video equipment – especially near your router and your Kodi playback device (ahem – we mean pointed right at it). FireStick Tip: Just about the only real issue with Amazon’s FireStick is that it overheats consistently. So get a small USB fan and mount it or set it pointing at your FireStick to cool it down and reduce buffering and playback issues. The AddOn Installer for Kodi is a gift from a magical place. This is the easiest and most sure-fire method to install addons & apps in Kodi! The Config Wizard is an automated version of the AddOn Installer than installs all the best addons in one fell swoop. Pro Tip: Sometimes it doesn’t work 100% right, which is why I prefer using the AddOn Installer to install Kodi Addons. The Ares Wizard is an experimental software project that is basically a customized version of Kodi intended to provide a different type of experience. If you’re the experimental type who doesn’t mind walking themselves through some bugs, check it out and tell us what you think. But if you’re a novice and you don’t know Kodi that well, you should probably avoid Ares Wizard due to its experimental nature. You can essentially get the same main functionality of Ares Wizard out of the AddOn Installer or Config Wizard! If you’re “perpetually on-a-budget” like myself, I recommend you use this guide to slowly acquire the individual pieces of the Ultimate Kodi Home Theater one-by-one and add them as you purchase them. Pretty soon you’ll have the whole setup for just a few hundred bucks. You can also pass this guide to a “novice” tech user (such as a friend or relative) who could use a little info on how they can make their movie experiences better on the cheap.